The non-profit Fashion Meets Music has opened a pop-up shop at Westfield Stratford (or Eastfield as I like to call it). The shop showcases a number of new and up and coming designers and artists, and also holds events, for example fashion shows and music performances. "After an explosive launch on Friday 6th September, to kick-start London Fashion Week, the Fashion Meets Music pop-up is now open to the public in Westfield's Stratford City showcasing emerging designers, entrepreneurs, artists and creative individuals. Fashion Meets Music is a not for profit organization, known for producing red carpet events which showcase all emerging forms of creativity on one night, from fashion shows, to music performances and live DJ sets. We have now implemented our event format into a retail setting via Pop Ups. Following the success of our Camden Lock Pop Up, Westfield Stratford is now housing our innovative shop; What was initially a 6 week lease has been extended to a further 3 months thereby giving our designers the holiday season for trade. We approached Company Magazine to get involved by sponsoring our window graphics for our magazine themed store which has been a big hit with shoppers and designers alike. As well as being able to purchase from our talented emerging talent we also house free mini fashion shows on our instore runway, performances, beauty evening and workshops including radio/Djing, jewellery making, fashion construction and more. The store also features an Eco-Lounge with in-house tailor, Westfield first, who works on customizations, alterations, repairs and sewing for all client needs on Tuesdays, Wednesdays and Saturdays while you shop. 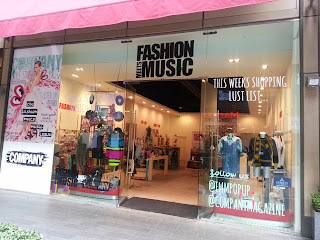 The shop is allocated on The Street, several doors from Celeb Boutique and New Era."